As the weather starts to brighten up, make the most of it and take advantage of all of the great things that Central Ohio has to offer. Whether you are looking for an afternoon of family-fun or an evening out with your significant other, Central Ohio has it all! Here are some fun events going on near you this month. What: Join your favorite furry friends in your neighborhood at Sesame Street Live! In Make Your Magic, Elmo discovers that magic can be found anywhere if you believe in yourself. Don’t miss the fun when magician extraordinaire Justin visits Sesame Street to put on a magic show for the whole neighborhood, Elmo wants to be part of the big event. But there’s one problem. Elmo does not know how to do magic! What: On the first Saturday of each month, thousands of visitors converge on High Street in the Short North Arts District for Gallery Hop, a celebration of art featuring new gallery exhibitions, street performers, special events, food and drinks, and more throughout the District. Though many shops and galleries are open earlier, Gallery Hop officially starts at 4:00pm and runs to 10:00pm, with restaurants and bars staying open considerably later. With dozens of galleries and non-traditional exhibit spaces, its Columbus favorite night of the month to celebrate art. What: Monster Jam®, the unexpected, unscripted, and unforgettable family-friendly motor sport brings a new level of high-flying, four-wheel excitement to the Schottenstein Center on April 6 & 7. What: The opening artist for this concert is Josh Phillips followed by Tyler Farr. Tyler Farr is an American country music singer and songwriter. Originally signed to BNA Records, Farr released two singles for the label before it closed. He then transferred to Columbia Records Nashville, for which he has released two albums: Redneck Crazy in 2013 and Suffer in Peace in 2015. Doors for the show will open at 7PM. Tickets are $30 in advance and $35 the day of the show. There is limited inventory so buy tickets before this event sells out! What: Mark your calendars, Buckeye fans! Ohio State has announced that the 2019 spring football game will be held on Saturday, April 13 at Ohio Stadium. The time has not been announced yet, but the spring game usually begins at 1 or 1:30 p.m. Parking is free. Current OSU students get in free with a valid OSU ID. For more information & tickets click here! What: Disney On Ice presents Frozen! Dazzling ice skating, special effects and unforgettable music will transport you to Arendelle. Be a part of Anna’s fearless adventure to find her sister, Queen Elsa, whose icy powers have trapped the kingdom in an eternal winter. Join snowman Olaf, mountain man Kristoff and loyal reindeer sidekick Sven as they help Anna in a race to bring back summer.Hosted by Mickey and Minnie Mouse, the whole family will delight in appearances by stars from Toy Story, Finding Dory, The Lion King and the Disney Princesses. Experience magic at every turn at Disney On Ice presents Frozen – the show worth melting for! What: The PBR brings the toughest athletes on earth back to the Schott. Expect high-flying rides and action as the Top-35 bull riders in the world take on some of the rankest bulls around. Last season Brazilian Fabiano Vieira put together a flawless weekend performance and capture the title. AJ Styles vs Randy Orton. Plus, SmackDown Women’s Champion – Asuka, Rey Mysterio, The New Day, The Miz & many more LIVE! 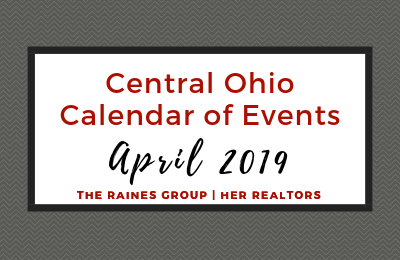 For a full list of things to do in Central Ohio this April visit the Experience Columbus website!